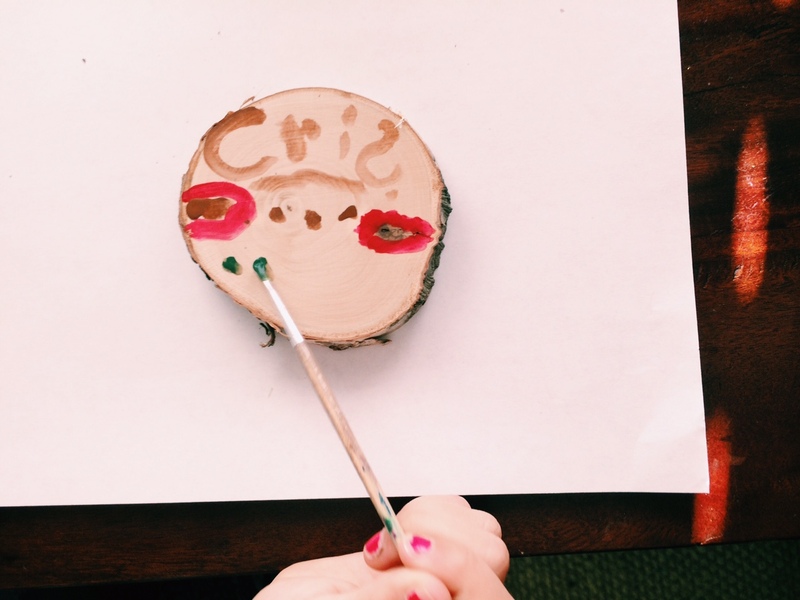 Our family DIY project this week are some DIY coasters! These turned out really cute and were fun for the kids and even me to decorate yesterday afternoon. 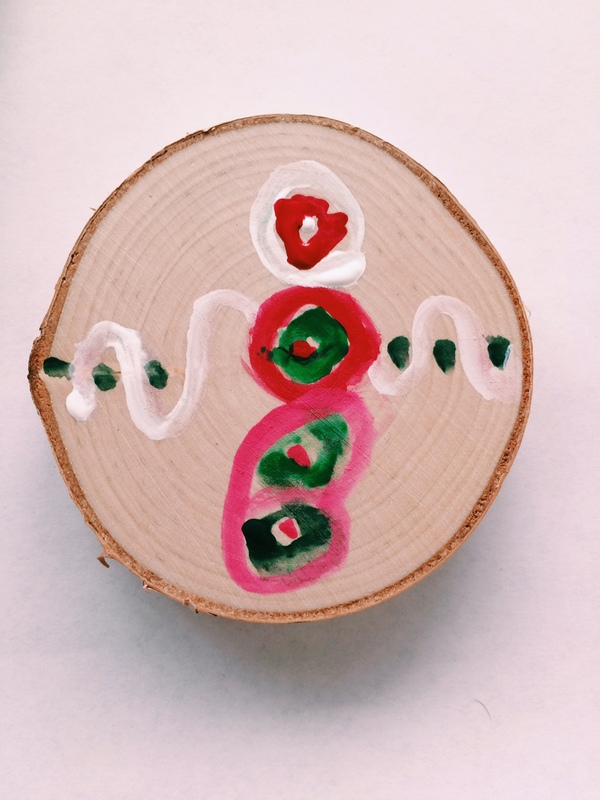 I like to pick projects that I know the kids can get into artistically, that are open-ended and also, projects that I’m interested in sitting down and working on myself, DIY coasters made the cut this week! 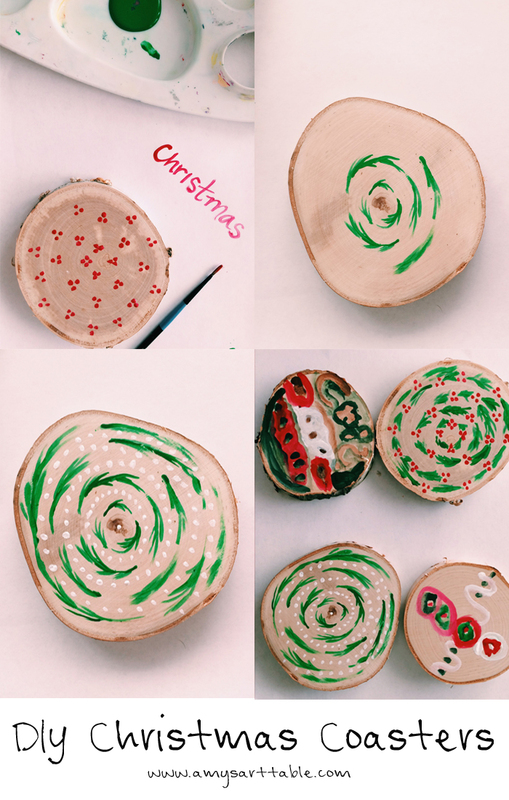 With Christmas coming up, we are excited to be getting into some seasonal crafts that can be used to decorate our house or give away as gifts. 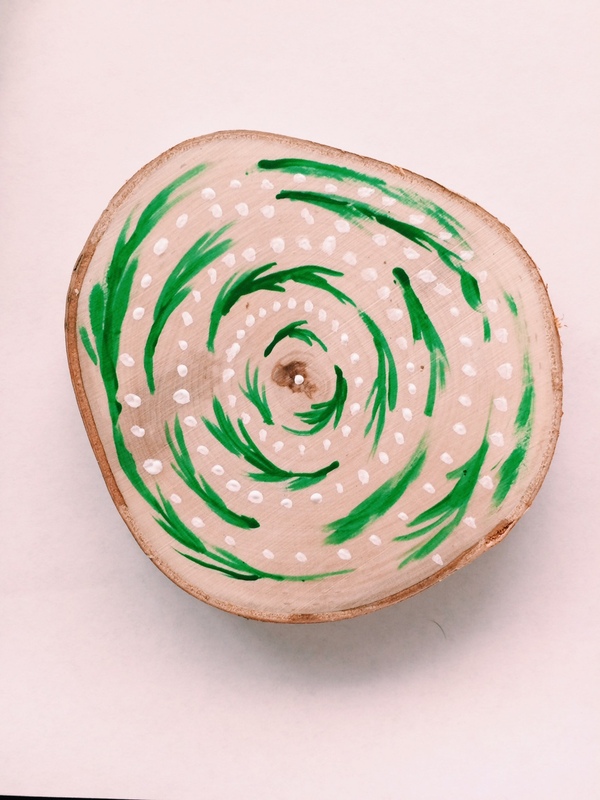 All you need to make this project are: wooden disks approx. 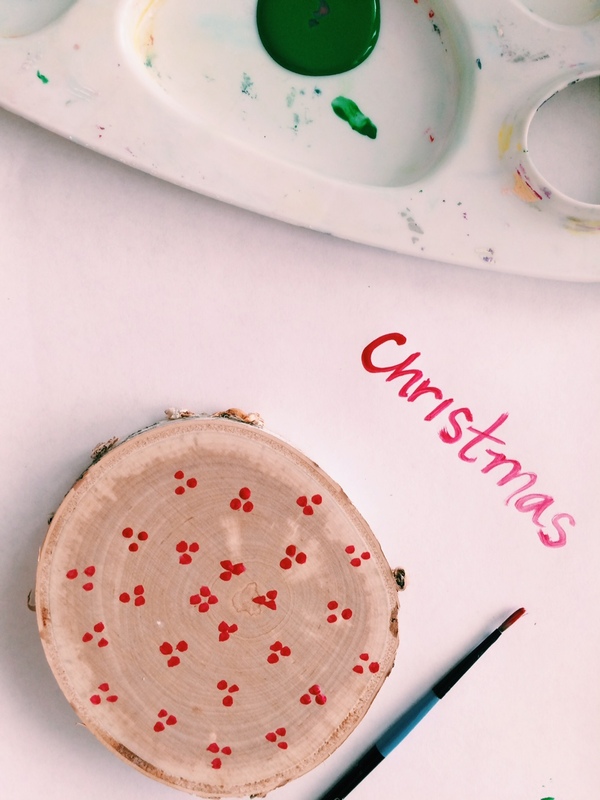 3″, craft paint in assorted Christmas themed (or seasonally themed) colors, paint brushes, and a bit of mod podge to use as a sealer. I started out by choosing a nice Christmas themed color palette. I stuck with the traditional red, green, and white but a blue or metallic theme would be really cute too. After establishing the color palette, I set up the kids with palettes and wooden coasters they could work on and make look however they wanted. 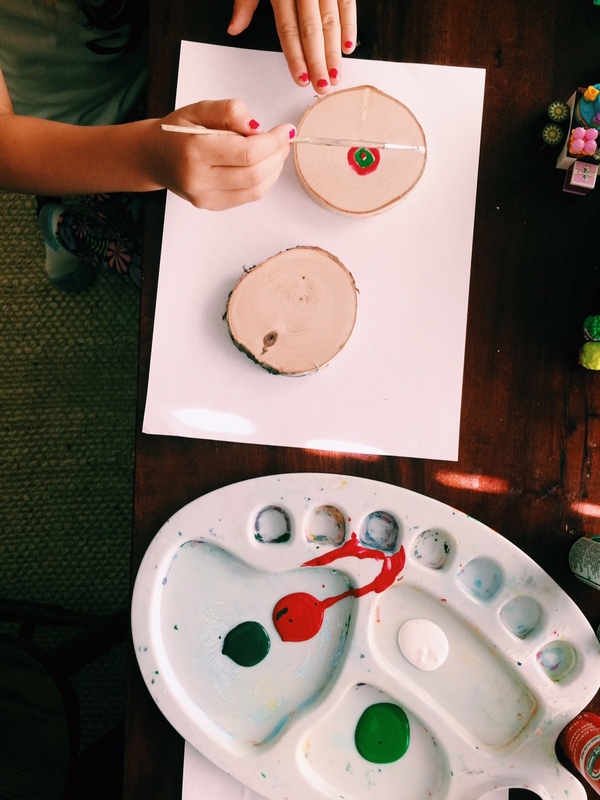 The trick to helping their projects turn out in a discernable yet artistic style all their own, is to limit the number of paint choices for them. Setting the parameters will help them to get creative without mixing tons of colors into that pretty–umm brown color. As the kids worked on their wooden coasters, I started working on patterns on my own. I used a circular pattern mimicking the tree rings from the wood. After everything is dry, simply seal it with non-toxic, mod podge for a shiny and safe, finished look. These coasters turned out so cute and would definitely make a sweet Christmas gift. Don’t forget to grab some free digital artwork for Thanksgiving that is just two weeks away! And next week, I’ll be back with another family art lesson! Oh, and keep a look out for Christmas mugs making their way into the shop this weekend!